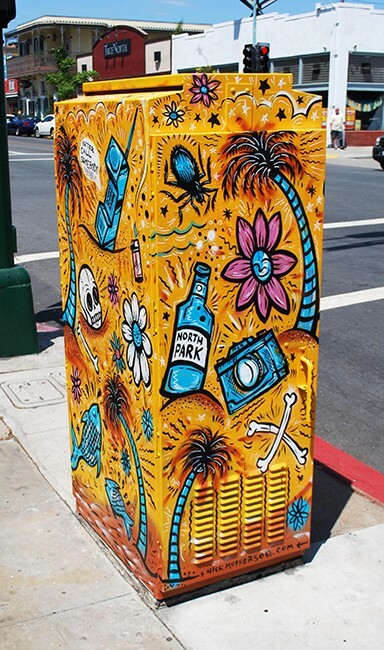 Since July, brightly colored murals of aliens, geodes, enraged octopi and more have taken over utility boxes across North Park. If Jason Gould has anything to say about it, there will be a lot more where that came from. 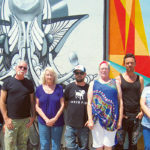 Gould, owner of art supply shop Visual, is bringing a wave of fresh public art to North Park in coordination with non-profit business association North Park Main Street (NPMS). 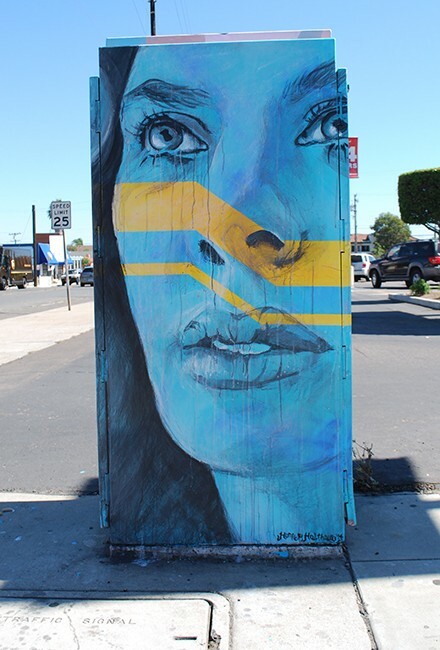 Dubbed the VISUAL Public Art Project, the effort has led to nearly 30 new murals on utility boxes across the neighborhood, and Gould hopes to do even more with some funding. In order to raise funds for more art and give local artists a stage to show their work, Gould and NPMS are hosting “Outside the Box: A Group Exhibition” on Nov. 6 at Union Cowork in North Park. 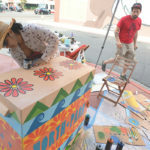 The exhibition will feature art from the 30-plus artists who have decorated a utility box through VISUAL, as well as local restaurants and breweries raising money for future projects. Photographs of the VISUAL projects will be on display at the exhibition as well as other works of art for sale by each of the artists, who include Katy Yeaw, Absorb81, Chris Konecki, Jorge Guitierez, Nomad, Matthew Agcoliol and many others. 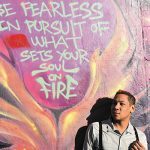 The event is free to attend and will run from 6 – 10 p.m.
“This is a great opportunity to literally be in the same room with some of the more notable contemporary artists that are doing relevant and current work in San Diego — North Park especially,” Gould said. 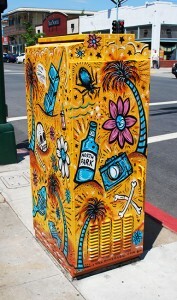 To-date, none of the artists have been paid for their work on the utility boxes, and Gould has donated most of the supplies from his shop. Although the boxes had already been painted more than ten years ago, most of the murals were peeling off or covered in graffiti. 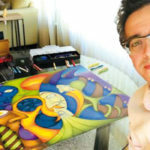 Some of the artists collaborated on their murals while others worked alone. “I’ve been trying to be open to a wide range of artists and experience levels,” said Gould. He says he has received an overwhelmingly positive response to the project on social media and from local business owners. 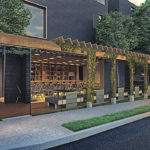 In the event that a property owner is unhappy with the artwork, he is open to changing the design. With enough momentum from the Outside the Box exhibition, Gould plans to set an even higher standard for public art in North Park. “Look what we can do without money — just think what we could do with a budget,” Gould said. 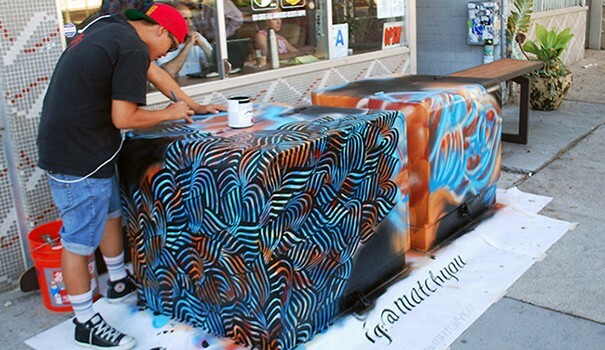 To learn more about the VISUAL Public Art Project or Outside the Box, contact Jason Gould at 619-501-5585 or jason@visualshopsd.com. —Contact Michael Crane at mcrane30@gmail.com.